Materials: Pressed crystal glass representing cut crystal glass. Gilt bronze (ormolu) swan decoration. White painted Bakelite socket. Period: 1970s – Neoclassical – Hollywood Regency. Manufacturer: S.A. Boulanger, Liege, Belgium. 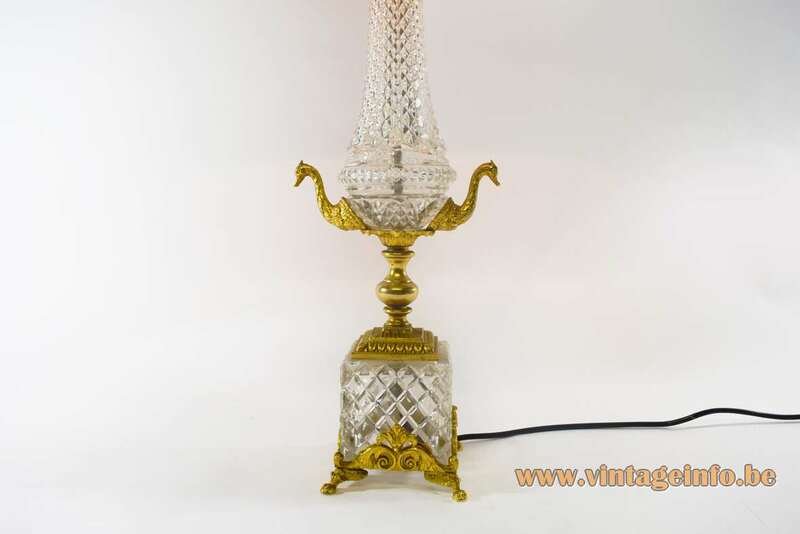 This lamp has a square crystal glass base resting on 4 lion feet. It is unclear if this metal is real ormolu or just moulded and polished brass. The crystal glass is pressed, so the quality is mediocre. 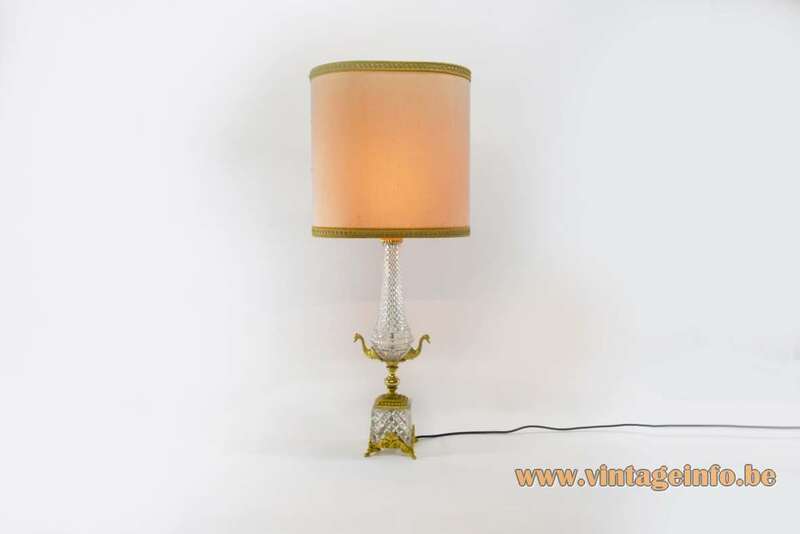 It is a table lamp made after the neoclassical French and English antique lamps. 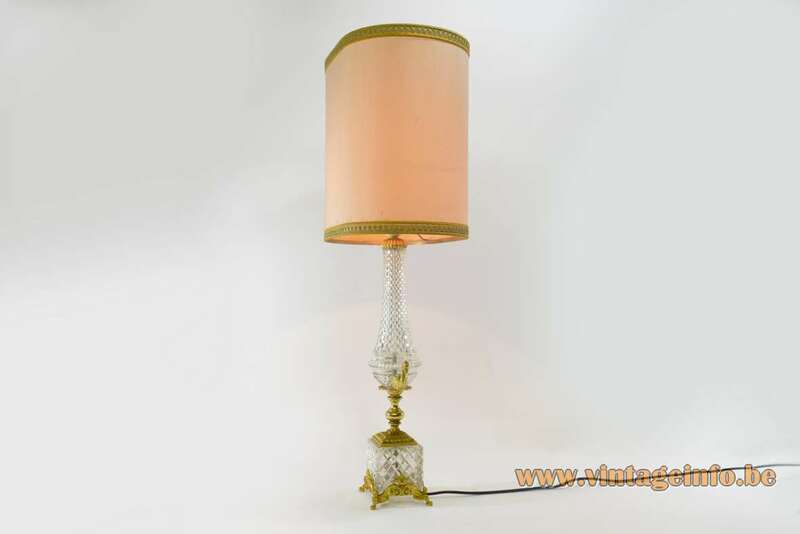 The “real” lamps are often presented as lamps made of Baccarat (France) glass or Waterford (UK) glass. 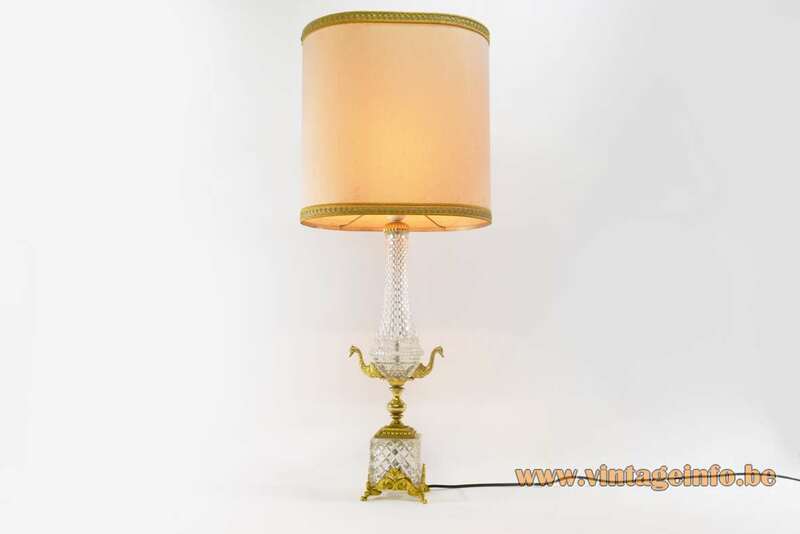 Many of the neoclassical lamps were made during the interwar period (1920-1940). 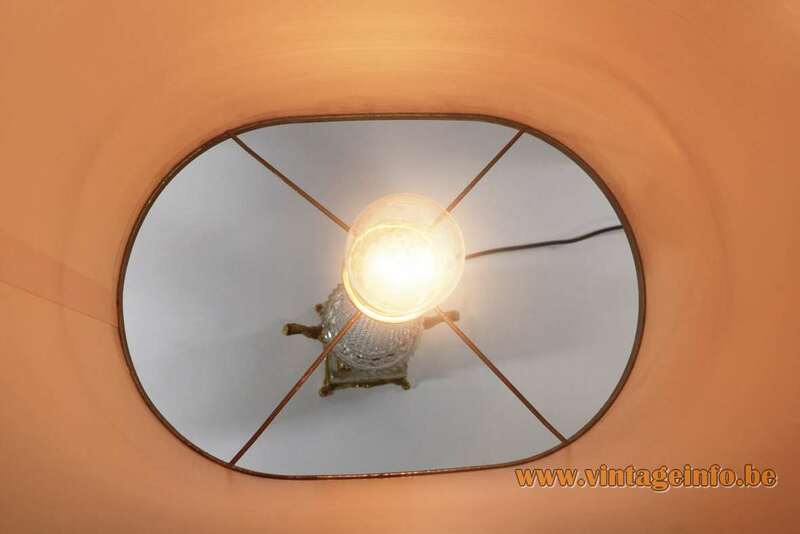 This lamp is from the 1970s, to see on the wiring. Ormolu is a process known as mercury-gilding or fire-gilding. A solution of mercuric nitrate is applied to a piece of brass, bronze or copper. Unfortunately, not much is known about the company. 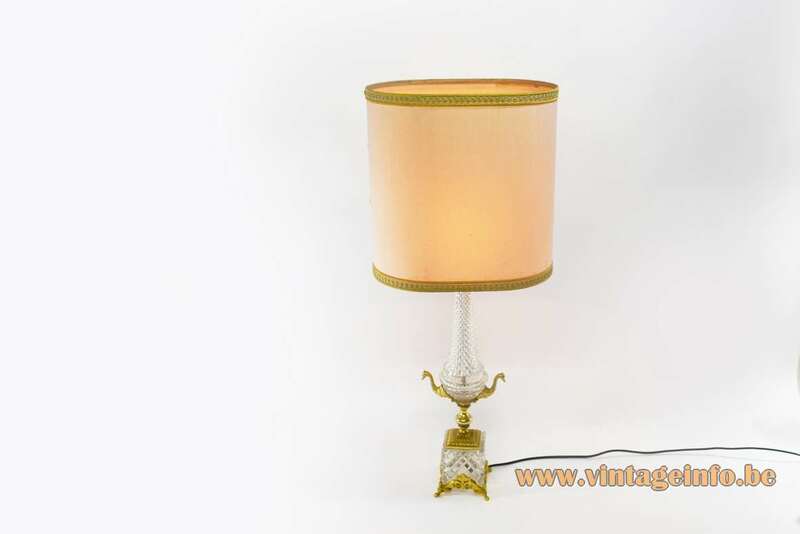 S.A. Boulanger is famous for the large amount of lamps the company produced that are designed by Gaetano Sciolari. S.A. Boulanger ended business somewhere in the early 1980s. There is nothing to be found in the Belgian Official Journal about the company/factory. The journal goes back to 1983. The company is not to be confused by the other Boulanger lighting company from Belgium: Les Ateliers Boulanger NV from Brussels. S.A. = société anonyme. French for anonymous society. All the electric parts were made by VLM Components in the 1970s. The company was founded in 1945 in Buccinasco, a small village near Milan, Italy. The company became famous for the switches they produce since 1968, designed by Achille Castiglioni.